Sumner started by refinishing the kitchen cabinets with a new product, a manufactured wood veneer that is durable, easy to clean, and comes in extra large sheets. 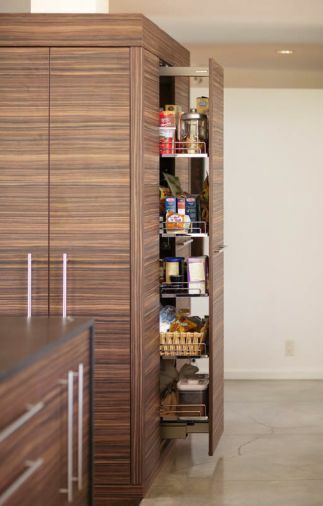 She chose a striking Tiger wood grain to wrap the cabinets horizontally, resulting in a continuous flow of pattern that is easy on the eye and dramatic. Sumner selected five Mooi Random Lights for kitchen and dining space. They had to be set individually to balance the adjoining rooms. Made of transparent resin, they are a whimsical note that Sumner loves and believes reflects the family’s sense of humor. 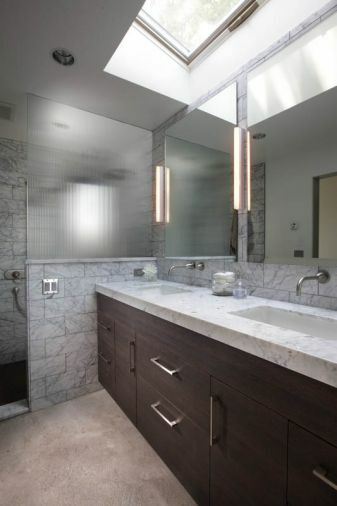 Sumner blended different and very rich materials in the bathroom as well, creating a subtle combination of elegance and functionality. Barbara Sumner, of Sumner Gray, was asked by her clients to “freshen up” their house in the Skyline neighborhood of Portland. “But the project turned out to be a little more complex,” Sumner says, referring to the challenges presented by the original 1950 footprint of the house and the industrial elements incorporated in a complete remodel about 10 years ago. Then there were the things that her clients didn’t like at all, such as dated cabinetry and a tall island in the kitchen that blocked the view into the family room. And Sumner had to immediately consider the huge paneled windows throughout, and the amount of light they let in all day long, in her design planning. It was both an opportunity and challenge, she says. She didn’t want to create a design that competed with the light, but she didn’t want it to be too stark either. 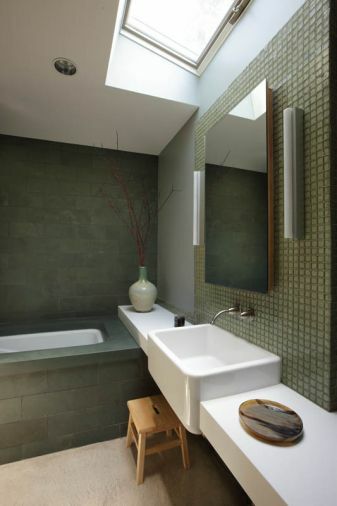 The result is a mix of textures, tones and design decisions that definitely complement the light. Sumner started by refinishing the kitchen cabinets with a new product, a manufactured wood veneer that is very durable, easy to clean, and comes in extra large sheets. 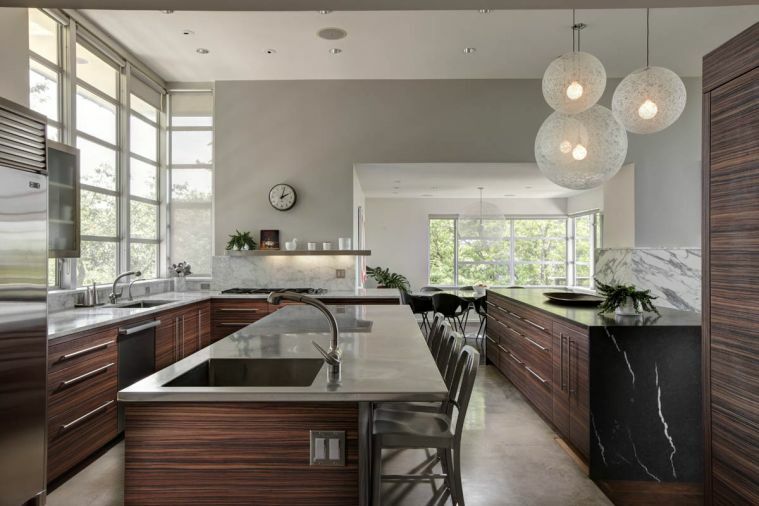 She chose a striking Tiger wood grain to wrap the cabinets horizontally, resulting in a continuous flow of pattern that is easy on the eye and dramatic at the same time. 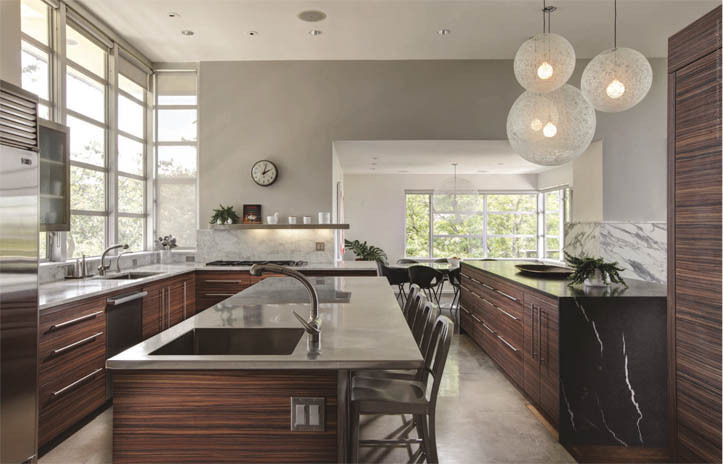 Sumner used stainless steel in several unexpected places to merge the kitchen details with the concrete floor left over from the industrial design of the previous remodel. It also kept pace with the dark wood, and white, black and grey color palette she selected. She deliberately installed only one steel-framed, glass-fronted cabinet above the counter to limit clutter. And, in addition to the stainless steel refrigerator and hardware, she installed a stainless steel shelf above the cook top, and used it as countertop material on the kitchen island. 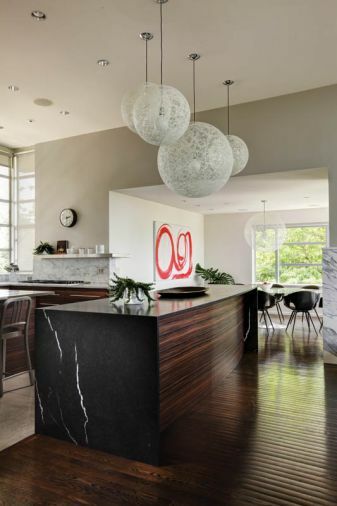 She varied the other materials, using grey and white Carrera marble on the counters that wrap the exterior of the kitchen and the backsplash, and a dense black limestone with white streaks on the divider between the kitchen and the family room. 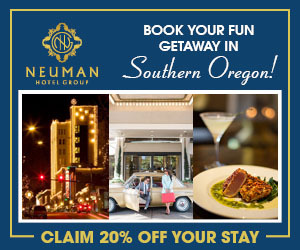 “Using different and very rich materials created a subtle combination of elegance and functionality,” says Sumner. Keeping with that approach, Sumner selected five Mooi Random Lights for kitchen and dining space. They had to be set individually to balance the adjoining rooms and to become the structural statement Sumner was hoping for. Made of transparent resin, they are a whimsical note that Sumner loves and believes reflects the family’s sense of humor and appreciation of wit. Just beyond the kitchen is the dining space that seats eight, which Sumner dressed with a Saarinen marble pedestal table and Poltronas leather-wrapped chairs. 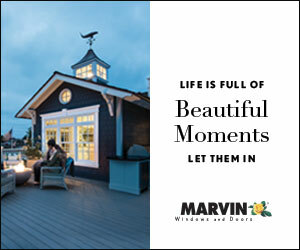 While Sumner considers this a special area where family and friends can gather, it becomes especially beautiful in the spring when the large cherry tree on the other side of the windows is in full bloom. Moving into the family room, Sumner focused on blending it with the kitchen since there wasn’t a visual barrier separating the two rooms any more. 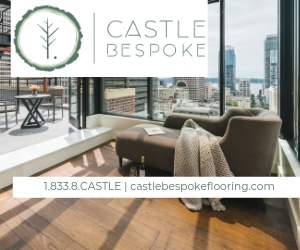 One strategy was to keep the color palette consistent with the kitchen and dining room, which also complemented the existing hardwood, ebony-stained hardwood floors. And if one wonders about the extensive use of white in a room intended for an active family, including two teens and a cat, Sumner explains that the materials used to upholster the chairs and sofa are very durable and easy to clean. “I think white upholstery often gives the illusion of being more fragile than it has to be,” she said. The small orange chests in the corners of the family room add a pop of color, and are also how Sumner honored her client’s affection for family pieces. “She has a number of family heirlooms that are of a more elaborate Chinese design,” Sumner explained. “We chose to use a few special ones to finish the room.” She mimicked the orange in the chests in the art in the dining room and in the accent pillows on the new lacquered credenza in the master bedroom. According to Sumner, her design directive was to update and streamline the house without making it “too precious.” Reflecting back on the project, she believes she achieved that goal and added some subtle drama along the way.